You haven’t demonstrated this. It is the typical Protestant stereotype. RC theology is officially Augustinian (grace-based), with the allowance that humans participate with God’s grace in that dimension of salvation that we call sanctification. Protestants agree with this point (except for some Lutherans). What we disagree on is the inclusion of sanctification in our understanding of salvation. In other words, RC theology is certainly not “works-based.” In practice, it sometimes leans that way, granted. But we need to be careful that we are dealing with a real (and I agree, flawed) theological stance, not a straw man. Again you misunderstand. The priest declares the reconciliation that Christ attains for us. It is not the priest’s attainment, not his power, that secures reconciliation for us. Augustine explicitly taught against this stance when he fought the Donatists. While it is true that the sacrament may be performed only by a duly ordained priest, the sacrament and its power do not belong to the priest. This is another fundamental Protestant misunderstanding (caricature) of RC theology and practice. 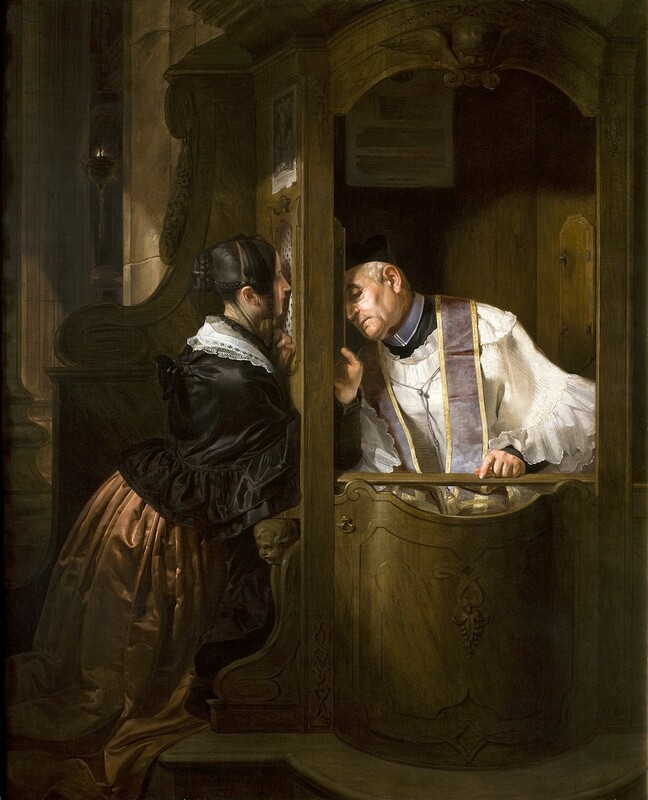 While it is certainly up for debate whether we require a duly ordained person to hear our confession (perhaps not, though it has benefits in the realm of church order, and C S Lewis recognized this, practicing confession to a priest for the last few decades of his life), and I am inclined to side with Luther on this, nonetheless in Catholic theology the priest is “necessary” to the sacrament only as officiant, not as the person with the power, in and of himself, to forgive or absolve. That power is recognized as being Christ’s only. Important note: the “works” involved in the Catholic theology of penance are two: (1) confession (which you are recommending for Protestants! And make no mistake, it is a work) and (2) works of satisfaction, which are a sort of “spiritual discipline” intended to move the individual forward in their sanctification. This, too, many Protestants affirm. Think of Richard Foster, Dallas Willard, Eugene Peterson . . . and John Calvin, who spent the whole third chapter of his Institutes of the Christian Religion talking about sanctification as including human participation to both “mortify” sin in the body and “vivify” the spirit. His problem, as has been clearly demonstrated by Protestant as well as Catholic historians of theology, was with a corrupted, non-Augustinian stream in late medieval humanist-influenced Catholic theology, called the “theologia moderna.” This sub-tradition insisted that once you “did your best,” God would honor that and bring you salvation. This was not the historic teaching of the Catholic Church. That said, I expect I’ll see some heated responses to this post. Perhaps even some light, correcting any mis-emphases I may have committed here. This entry was posted in Medieval Wisdom for Modern Protestants, Resources for Radical Living and tagged Catholic Church, confession, John Calvin, Martin Luther, Roman Catholicism, sacrament of penance, sacrament of reconciliation, salvation, sanctification, Theology. Bookmark the permalink. Hi Dr. Armstrong – Thanks for your website! I spent 54 years in the Roman Church (left it 5 years ago), having experienced both Vatican 1&2, Catholic School, etc., and I’d have to challenge something you said, please. (Emphasis on “I”, which is required). I have personally heard this “first person coveyance” (“I” forgive”) for nearly a half century – regardless of ones interpretation of the CCC. Pls note: Fr. O”Brien’s book was a best seller, and carried the official RCC “Imprimatur” /”Nihil Obastat” seal, indicating “free from Doctrinal Error. Still further, Pg 171 (Reconciliation example) notes his explanation “..I in my official capacity as a ambassador of Almighty God, acting in His name and by His authority, exercise a power which far transcends that of a human being (to forgive) and is in truth, the very power of God Himself…(ie The distinction between a man in his private capacity and his official position as ambassador or “Alter Christus”.) O’Brien uses the “another Christ” example throughout, and by that belief, substitutes himself in the role of Christ to forgive… by assuming that role and that power (by his own, direct, inherited power–which priests, bishops and popes of the early ages used to manipulate and control, yes). I honestly don’t think your student’s views were a caricature of the belief or common praxis of this belief. (FWIW, O’Brien’s book was one of the main reasons I left the RCC). If I’m wrong, pls don’t hesitate to correct where I might be missing something.